i.e I1 = I2 = I3 The current flowing into and out of the parallel branches is sum of the individual current in the branch. p.d across the whole circuit is sum of the p.d across each component. 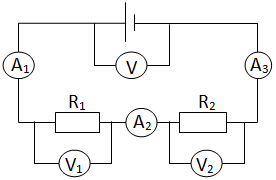 The combined resistance for the whole circuit is sum of all the resistances. Note that Reff is always smaller than the smallest of the individual resistance. Note that “combined resistance” is also known as “effective resistance” or “equivalent resistance”. Light bulbs connected in parallel are brighter than that connected in series. When one of the bulbs in parallel circuit blows, others will continue to glow. However, when one blows in series circuit, the entire circuit will be open. None will glow. The power source in parallel circuit will deplete out faster than that in series circuit. Pay attention to question! Which effective resistance is required! Sometimes, it is not always for the whole circuit. It can be just between two points. 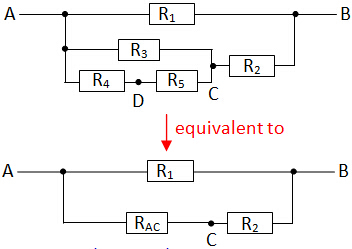 Try to draw an equivalent circuit such that all the resistors in straight lines. When redrawing the circuit, simply following through the wire. 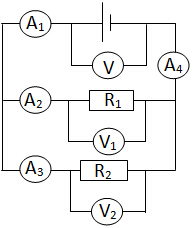 (a) If you do not know how to start this, try to redraw the circuit. ﻿I1 is the current from power source. (b) between A and B. ﻿(b) Main focus is on A and B. One goes to R4 followed by R5. Step 4: Branches rejoined at B.